Mindscan Software Solutions - is a premier windows hosting company in New Delhi - India, provides domain name registration, website designing, website promotion,E-commerce solution, payment gateway services in India with excellent customer support. A Payment Gateway provides credit card processing, billing, reporting and settlement and operational services to acquiring and issuing banks, manages the process of transferring authorized and captured credit card funds between different financial accounts such as the merchants company checking account. These corporations typically charge merchants a discount rate and a transaction fee for this service. These fees vary from processor to processor. At Mindscan Software Solutions we offer custom solutions to make your website an Online Market Place, where anybody can logon to your website and buy from your Online Store. You can add mostly all credit cards including (Master Card, Visa, American Express Card, and Citibank etc). 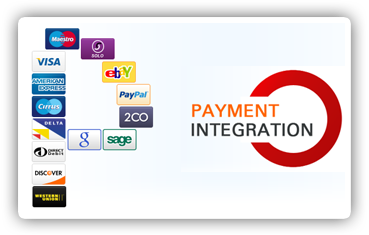 You are not required to do any coding, as we can handle the complete payment gateway integration process. Our programmers are familiar with almost all types of payment gateways and their APIs (Application Programming Interfaces. Internet Payment Processing refers to the process of obtaining the payment details on the Internet from the customer in a secured environment, processing the data and authenticating the transaction through the acquiring bank. Our Payment Solution is fully equipped to handle the volume of transactions in a secured environment, processing and transmitting data quickly over the Internet. Highest level of Security for processing transactions. Compatibility with almost all popular shopping carts. Simple & User friendly operation and management. Transaction Management: Extensive, Internet enabled reporting features. Validation & Authentication: Our payment gateway has a powerful built-in validation mechanism, which detects inconsistencies in the data provided by the user before the transaction is put through the acquiring bank. Personalized customer support: Each merchant would be allocated an Account Executive who will be interacting with the merchant for customer support. Payment Management:Our Payment Solution also provides an exhaustive payment management module. The Payment Management module is Internet enabled and the merchants can view their reports by logging on to the site. The module provides a wide range of reports on volume of transactions, status of transactions, etc. with facility for searching specific transactions by supplying one or more criteria.